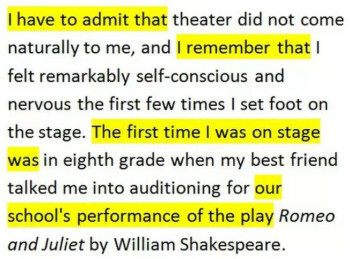 Theater did not come naturally to me, and I felt remarkably self-conscious and nervous the first few times I set foot on stage in the eighth grade. My best friend had talked me into auditioning for Shakespeare's Romeo and Juliet. Not only do I find basketball fun, but the sport has helped me develop my leadership and communication skills, as well as my ability to work with a team.As a result,my love of basketball will make me a better business major. 以上图为例，这一段描写的是对作者产生重要影响的哥哥。作者对哥哥真是不吝赞赏之词，可惜，用词方面太过陈腐。one in a million这词读者都听过a million times了。这些词让读者对他哥哥兴趣全无。来看看把这段话中的陈词滥调修改以后，文章是不是活力十足! Throughout high school, I have tried to emulate my brother. He takes his responsibilities seriously, yet he is generous when dealing with the shortcomings of others. This combination of reliability and graciousness makes others turn to him for leadership. 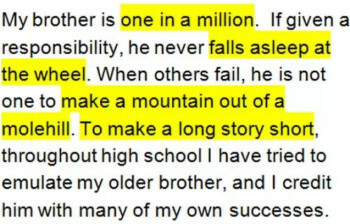 My own successes in high school are due largely to my brother's example. 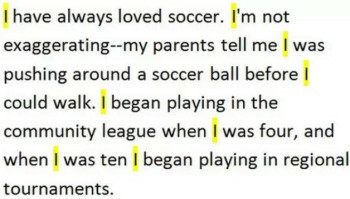 Soccer has been a part of my life for longer than I can remember. Literally.My parents have photos of me crawling around as a baby pushing a ball with my head.My later childhood was all about soccer -- the community league at age four, and participation in regional tournaments by ten. 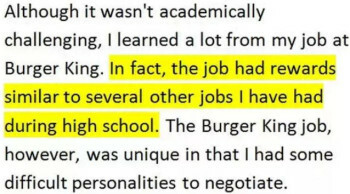 Although it wasn't academically challenging, I learned a lot from my job at Burger King because I was forced to negotiate some difficult personalities. The game was close. I won't receive credit for our win, but I did pass the ball to my teammate who scored the winning goal. 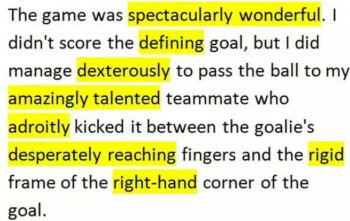 He received the praise for kicking the ball into the narrow space between the goalie's hands and the upper corner of the goal post, but the victory was really about a team,not an individual. More than anyone else, my brother deserves credit for my achievements in high school. I can trace my successes in academics and music back to my brother's subtle influence. As the opposing team approached the goal,a striker kicked the ball towards the upper right corner.If I didn't block it, my team would lose the regional championship. 再罗嗦一句，被动语态不是语法错误!有时，当你需要强调句子的宾语时，被动语态是必要的。例如，如果你想表达一棵300年树龄的古树被闪电击中这件事，你要强调的重点或许就是这棵古树，而不是闪电，这是你可以用被动式：The beautiful 300-year-old tree in your front yard was destroyed by lightning. It was the final goal of the game that determined the state championship. 改后：The final goal of the game determined the state championship. There were two students at my summer camp who had severe psychological problems. 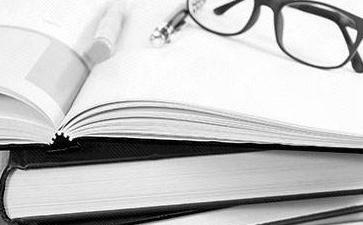 改后：Two students at my summer camp had severe psychological problems. It is Saturday when I get to spend time at the animal shelter. 改后：On Saturday I get to spend time at the animal shelter. 不过要注意的是，不是所有的it is, it was,there is,there are都是虚字结构。如果it和there在句中有先行词，也就是有具体的指代内容的话，那就不是虚字结构了。例如：I have always loved music.It is one of the most important parts of my life. 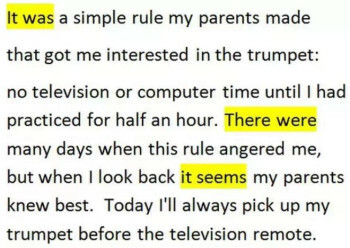 My parents made a simple rule that got me interested in the trumpet: no television or computer time until I had practiced for half an hour.This rule often angered me,but when I look back I know my parents knew best.Today I'll always pick up my trumpet before the television remote.